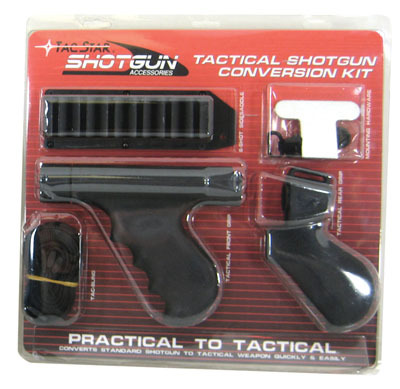 Now all the accessories you need to convert your shotgun from hunting to tactical in one easy kit. Includes front and rear tactical grips, 6-Shot sidesaddle, tactical shotgun sling, barrel magazine clamp, and a quick detach sling swivel set for the mounting sling. Complete step by step mounting instructions are provided. Each kit is especially designed for the appropriate Remington or Mossberg shotgun. Kit represents a 10% savings over individual purchases. Available for 12 Gauge only.